Radley Gift Boxed 'Elwin Street' Navy Crossbody Bag BNWT RRP £109 Brand New! Fully lined with zip and slip pocket. (Gorgeous genuine Radley London bag in very good quality leather. Grab a bargain :). Condition is Used but perfect. 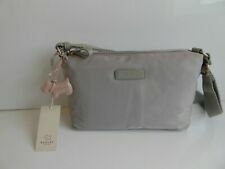 Radley Brabican Silver Grey Nylon Cross Body Bag. Fully Lined with zip and slip pocket. Leather Black Radley London Messenger/ Cross Body Bag 💼lovely Con. (Genuine Radley London bag in very good quality soft Black leather. Grab a bargain :). Large Black Radley London Messenger/ Cross Body Bag 💼lovely Con. You wont be disappointed with this high quality Radley bag. Front has a flap over pocket with magnetic fasten. The bag is in a very good to excellent condition, the only sign of wear is to the little front button on the flap which has darkened. Radley Palace Street Black leather crossbody/shoulder bag. Inner zipped pocket and slip pocket. Dog charm is missing. Outer back zipped pocket. Outer front large slip pocket (under flap). Condition is Used. A very attractive Radley crossbody bag in excellent clean used condition. RADLEY leather cross body bag in Salmon Pink USED ONCE. Complete with dust cover, and little Scottie dog. Lovely condition. Perfect for summer weddings, holiday etc Condition is Used. Dispatched with Royal Mail 1st Class. STUNNING BLACK STRONG LEATHER RADLEY CROSS BODY BAG IN GOOD USED CONDITION. Black polyester Quilted material, with black leather handles, zip pulls and plaque on front with Radley London printed in gold. A beautiful warm brown colour, this large pocket bag with old style pocket on strap, with 3 sections is always been a favorite, as they are lovely to carry! LARGE POCKET BAG. front slip pocket. features a back zip pocket. O uter pocket with zip. I nner pocket and 2 pouches. Radley oilskin cross body bag - blue with dark blue circles. Full Radley lining. Has a full zip enclosure with an internal zip pocket and 2 open pockets. Radley Pockets Burgundy Large Leather Across Body Bag. Front slip pocket with phone holder pocket. Fully lined with zip and slip pockets. Rear zip pocket. This design has no hanging dog and is not supposed to. 9 x 10” inches. There are some marks on the right of leather of this bag please see the pictures. The inside of this bag is perfect. Radley Aldgate 3 compartment leather Grab/crossbody/shoulder bag. Radley Aldgate Grab/ crossbody/shoulder bag. Radley Aldgate dog charm. Inner zipped pocket and slip pocket. Outer back slip pocket. Radley Black Woven leather crossbody/shoulder bag. Inner zipped pocket and slip pocket. Long buckle adjusting strap extends to approx 126 cms. 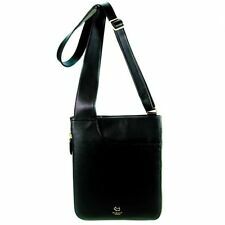 New listingRADLEY BARRINGTON BLACK LEATHER HANDBAG SHOULDER CROSS BODY BAG RRP £169 NEW!!! RADLEY BARRINGTON BLACK LEATHER. Radley elegant black cross body/shoulder classic leather bag. Combination of smooth and grain leather. Adjustable strap, inner pockets. Pocket outside at the back. Leather Black Radley London Messe/ Cross Body Bag 💼lovely Con. (Genuine Radley London bag in very good quality Black leather. Grab a bargain :). Cream leather accent top zip panel. 19 x 5 x 15 cm (width x depth x height). RADLEY LONDON BAG. 1 INTERNAL ZIP POCKET - HOWEVER THIS ZIP IS MISSING THE PULL TAB PART BUT STILL WORKS TO OPEN AND CLOSE THE POCKET. BLACK LEATHER BAG. HAS 1 SLIP POCKET ON THE BACK OF THE BAG. ADJUSTABLE STRAP. Navy leather Chelsea crossbody or shoulder bag, flap over style, back pocket, three internal pockets. Black Radley dog tag and dust cover. Size 9x7x3 inches. Bnwt. radley flower bag Cross Body. Condition is New with tags. Dispatched with Royal Mail 1st Class. Colour Tan. small zip pocket inside. 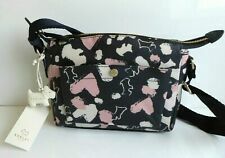 BEAUTIFUL RADLEY POCKETS BAG BNWT. LILAC RADLEY DOG. LARGE BACK ZIPPED POCKET. FRONT SLIP POCKET WITH A PHONE HOLDER. There is a zipped inner pocket as well as an unfastened inner pocket. Strap Drop Length: 58cm. Vintage Leather Pink Radley Crossbody bag. Vintage Leather Pink Radley bag. Shoulder or crossbody. Strap drop is 20.5 inches & this can be adjusted. Length 10 inches Width 9 inches. Radley signature white leather dog attached to bag. Radley embossed on outside & inside of bag. This bag has been used when travelling & the upper part of the main compartment is marked dirty brown. The other compartment which was less used is clean & the back compartment is also clean. Lovely leather bag in good vintage condition. See all photos. Strictly no returns. Smoke free home. Radley Part Leather Shoulder Bag, Laptop Bag, Handbag Excellent Condition size 39cm x 31cm x 10cm. Dog charm included and intact. Lots of inner pockets and front pocket. One side as you can see is a little darker with a slight stain, just needs a clean. We think you will love this smart little leather bag by Radley. Radley London Medium Fodaway Crossbody. Condition is New with tags. Dispatched with Royal Mail 1st Class. ZIP CLOSURE- HANGING DOG-FRONT POCKET WITH AN INNER POCKET FOR A PHONE - VERY HANDY. INSIDE HAS MORE POCKETS AND ZIPPED SIDE POCKET. ADJUSTABLE SHOULDER STRAP. Condition is Used. 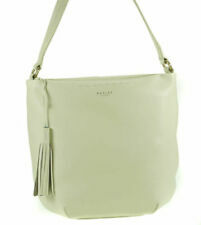 A delightful small crossbody bag from Radley in a pale greyish Green. It has two sides to it, both with a zip closure and one of the sides has an inner zip pocket and a slip pocket, the other no pockets. Radley Red Leather Small Pocket Bag. Cross Body. Immaculate! Radley Red Leather Small Pocket Bag. Cross Body bag in immaculate condition. A beautiful shade of red with silver coloured hardware and pink lining. Radley Leather Crossbody Bag. H30 x 22 x 5 cm External slip pockets front and back and internal zip pocket / phone pocket Dispatched with Royal Mail Signed For® 2nd Class. 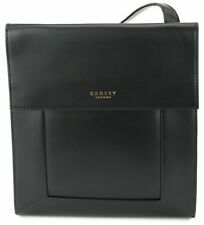 Radley Parkhurst small bag - 1 7 x 2 4 x 9 c m in black structured leather. Magnetic catch. Radley Cross Body Bag, small.